The changes that occur with the transformational practice Kundalini Yoga have been amazing to witness. I recently completed teaching a 6-week series of introductory classes and saw firsthand the changes that happened – fast. I tell people how quickly things can change and how calm you will feel even in your first class. Now, they actually believe me! My wish is this – that after reading this article you try one in your area or come to a class I am offering. This week I am sharing a fabulous article from Yoga Journal. Please read all the way to the end and SHARE this newsletter with your family, friends and co-workers. Kundalini Yoga clears blocks in your energy field. Kundalini Yoga is a magical science that uses sound, mantra, energy healing, exercises and meditations to release trauma from the energetic body, which surrounds the physical body. It is this field, known as the aura, that holds wounds. When those wounds are healed, radiance can occur. Radiance is the magnetic frequency that draws in beauty, love, and light. Attracting abundance into your life starts in the subtle (energetic) body–not the mind. Kundalini Yoga helps us recognize that abundance is our birthright and living from our hearts is the surest path to prosperity. When we are able to listen to the whispers of the heart, we are able to tap into the magnetic force of the universe, which is love. When we live in that frequency of love, we feel gratitude. Like attracts like, and therefore gratitude attracts more gratitude. Many people feel as if they have done everything possible to create the lives they want, however they still feel stuck. Kundalini Yoga is a technological miracle that makes the impossible possible through the laws of quantum physics and energy. Kundalini yoga quiets your mind. The practice of Kundalini Yoga quiets the thoughts that keep us feeling fearful, stuck, and insecure, so that the heart and soul can flourish. Our heart shows the pathway to our highest potential, not the mind! But our heart’s voice is quiet. It can easily be drowned out by the whirling thoughts of our ego-driven mind. When our heart is in in alignment with our soul’s mission, everything flows. Our sensitivity awakens, and our intuition opens. We can let go of the pain of the past and the fear of the future by being present in the moment. The breathwork and sacred mantras of Kundalini Yoga are wonderful for quieting our mind. Slowing our breath down puts the brakes on racing thoughts. Next time your mind is really spinning out of control, try playing a sacred mantra. The soothing sound current will shift the vibration to one of peace. Kundalini Yoga gives you confidence. Kundalini Yoga helps you recognize that you are worthy. In a Kundalini Yoga session, you are likely to come face to face with your self-imposed limitations–your inner walls–but you can miraculously dissolve them with the practice. The iconic Kundalini Yoga quote from Yogi Bhajan, “keep up and you will be kept up,” really works. After meeting the challenge of a Kundalini Yoga exercise, many of life’s challenges seem less overwhelming. The confidence you get from Kundalini Yoga arises from deep within. It does not depend on external circumstances. It is confidence that comes from having the genuine experience of connection to a reservoir of light and love that is much deeper than your limited sense of self. When we truly feel worthy of happiness and success, we are able to manifest our deepest dreams. 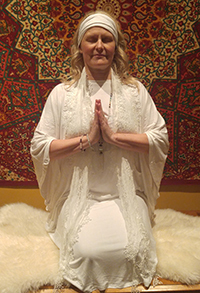 Kundalini Yoga connects us with the divine. Kundalini helps us to let go and live without attachment. We work our body, mind, and soul in a way that integrates oneness with the universe. This allows us to feel a connection to higher realms. The higher realms remind us to trust ourselves and to recognize that our pure essence is one with spirit, and, when we trust ourselves, we let go of attachment. We begin to give and receive energetically. We learn the beauty of giving by silencing the constant chatter in the mind. We stop “doing” and begin allowing. We learn that our true heart’s desire comes from the Divine, and we stop needing approval from others to honor our inner truth – our Sat Nam. When we free ourselves from the expectations of others, we begin to attract love into our lives by giving love. Kundalini Yoga builds strength and resilience. Our true strength comes from our core energy, not our muscles. If our energy reserves are low, we feel weak in body and in spirit, and our ability to persevere through the challenges of life diminishes. With regular practice, Kundalini Yoga helps us develop a profound core of prana–or life force–and a reservoir of love inside. We gain the ability to depend on that reservoir to deliver the strengths needed to meet the daily demands of life. Exercises like Ego Eradicator help to free the flow of energy through our body and mind. An incredible strength becomes tangibly accessible when the energy flows. The energy has always been available to us, but we were separated from our own light. Life will always mirror the challenges found in our inner energy field. By working through and releasing the inner energy blockage, a corresponding release in our life, thinking, and our spirit also occurs. This parallel of micro and macro is the secret power of how Kundalini Yoga enables us to create the lives we desire. When we are cleared of wounds and vibrating in the frequency of love, we attract more love. This is the law of (Kundalini Yoga) science. *** Try a drop-in class with me, or an entire series. I also offer one-on-one guidance and can travel to your location. The next Yoga retreat is Nov 5-7.